How to became a Key Person of Influence - Biļešu serviss "BezRindas.lv"
Business owners and leader think it takes many years to become a Key Person of Influence. They think it's about academic qualifications, hard work,luck, looks or charisma. Nothing could be further from the truth. With focus, you can become a Key Person of Influence un your industry much faster than you think. Daniel Priestley started out as an entrepreneur at the age of 21, and built a multi-million-dollar event, marketing and management business before the age o 25. 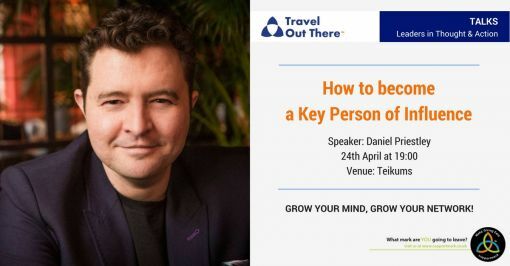 A successful entrepreneur, international speaker and best-selling author, Daniel has built and sold businesses in Australia, Singapore and the UK. Having a passion for global small business, Daniel is the co-founder of Dent Global, which has teams running world-leading business accelerators and events in the UK, USA, Singapore and Australia. Over 3000 entrepreneurs have graduated his accelerators over the last 7 years, and Daniel has rare access to global best practices around what's working and what's not working in business. As an active fundraiser, Daniel has helped to raise over £450,000 for various charities including charity: water, Peace One Day, and Key is E, and is connected to some of the world's most known and celebrated entrepreneurs and leaders. During the workshop, Daniel will show you how you can increase your inbound opportunities and referrals, charge a premium for your product/service, get featured regularly in the media, have a greater sense of purpose in business and overall, become the key person of influence within your industry. The first 20 people to check in will have the opportunity to have a professional portrait taken for their Linkedin profile! All the proceeds will be donated to SupportMark. WHAT: Travel Out There will be doing what they can to help with SupportMark's single goal of Making cancer Yesterday's News! WHY: 1 in 2 people will be impacted by cancer in their lifetime. The issue is this is not just a statistic, it's a reality, and if we leave it to others it will never get addressed. The impact investment generated from these events will support the work of research into cancer. HOW: Travel Out There will donated all income generated from their monthly talks to SupportMark. We will be charging a commitment fee of €7 to attend the event, and all proceeds will go to SupportMark.